← FINISHED! Father’s Day, Sunday June 18 at 11:30 a.m. FINISHED! 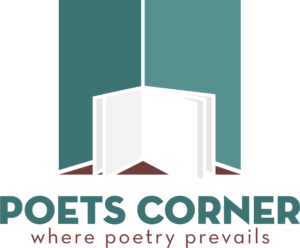 Poetry Reading on Sunday July 16 at 11:30 a.m.
June’s reading brought together two poets with very different Mennonite backgrounds. Yet each eloquently demonstrated how place and upbringing can so deeply inform good poetry. Patrick Friesen and Connie Braun both gave a stirring poetry reading, showing us how insightful, thought-provoking and heart-stirring poetry — good poetry — can be. Seldom do we get the chance to reunite poets who once shared a working life together. In the 70s, Brian Brett and Allan Safarik started a literary magazine called Blackfish. The periodical soon morphed into Blackfish Press, proclaiming to publish poets without government funding. 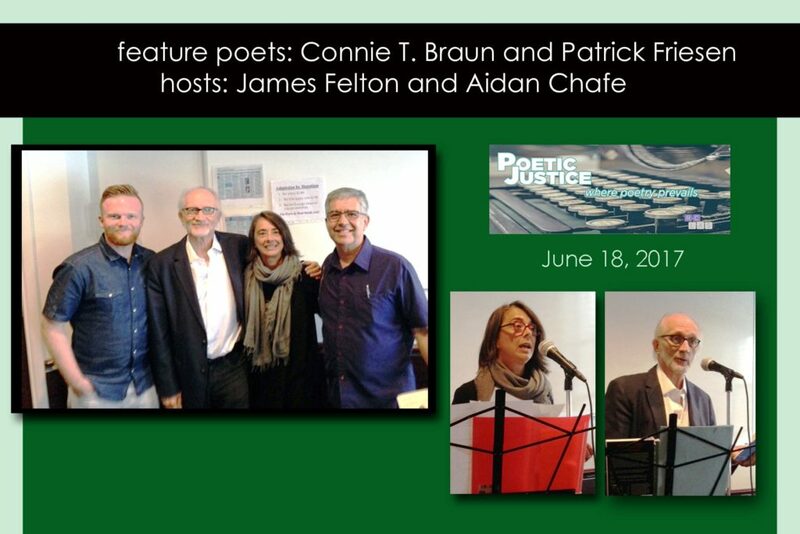 Poetic Justice is proud to reunite after many years these two icons of West Coast poetry and publishing. Make sure you don’t miss what will surely be a special occasion. All we can say is you have to be at our poetry reading on Sunday, July 16. Here’s more about both these iconic publishers and writers. 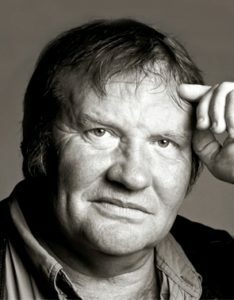 Brian Brett, former chair of the Writers’ Union of Canada and a journalist for four decades, is best known as a poet, memoirist and ficton writer. He is the author of thirteen books including his memoir, Uproar’s Your Only Music, which was a Globe & Mail Book of the Year selection. Trauma Farm: A Rebel History of Rural Life, won numerous prizes, including the Writers’ Trust annual award for non-fiction. To Your Scattered Bodies Go won the CBC poetry prize in 2011. A collection of poems, The Wind River Variations, was released in 2014. And the final book in his trilogy of memoirs, Tuco, was published in 2015 and was awarded the Hubert Evans Non-Fiction Prize. He was also the 2016 recipient of the Writers’ Trust Matt Cohen Award for Lifetime Achievement. 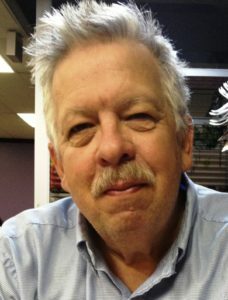 Allan Safarik is a prolific writer and editor in several genres. Born in Vancouver and raised in North Burnaby, he currently lives in the historic Jacoby House in Dundurn, Saskatchewan on the Louis Riel Trail and teaches Imaginative Writing at St. Peter’s College in Muenster. Safarik’s work is connected to two different regions: the West Coast of Canada and the Canadian Prairies. He is the author of sixteen books of poetry including When Light Falls From The Sun, winner of the Saskatchewan Book Award for Poetry in 2005. Notes From the Outside ~ Episodes from an Unconventional Life won the John Hicks Literary Non-Fiction Award in 2003. He collaborated with his father Norman to produce Bluebacks and Silver Brights (2012) an acclaimed eco-memoir about the Pacific Coast fisheries. Safarik’s historical novel, Swedes’ Ferry, 2013 has remained on the McNally Robinson fiction best-seller list for the past four years. Remember if you want a spot on the Open Mic list, get there early. At the last reading we had to disappoint a few of you. Those who missed out in June are given the chance to go first at July’s reading. But you have to be on time. See you all on Sunday, July 16. We’re underway at 11:30 a.m.